Following two sold out shows at London’s Roundhouse at the end of last year, Nothing But Thieves today announce their biggest tour to date. The fourteen date tour takes in five cities in the UK, including a huge headline show at London’s legendary Alexandra Palace on 23rd November. 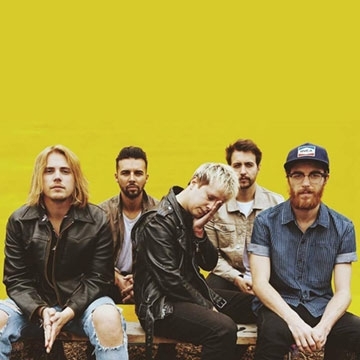 The scale of these shows is testament to the success of Nothing But Thieves’ critically acclaimed sophomore album ‘Broken Machine’, which hit the #2 spot on the UK album chart. Nothing But Thieves have been on an epic journey over the past 18 months with half a million albums sold & the same number of streams globally, these five lads from Southend have gone from playing to a handful of friends in Essex to sold out shows in 35 countries. Muse tours, festival headlines in the UK, Europe and the US, performances at Coachella and Lollapalooza, a headline tour in China, headlining gigs to over 20,000 people in South Korea have gained them a rabid fanbase that follow their every move. The band spent a big chunk of 2016 in America playing shows and performing on everything from Conan O’Brien, and James Corden, to Jimmy Kimmel , and their album became the bestselling debut from a UK rock band in the US that year. Their success continues to grow with the release of “Broken Machine” and Global Sold Out tours, making them one of the most exciting new bands to emerge from the UK.